Encouraged by my friend Shelley, I decided to submit a couple of photographs to the Upstream Gallery’s Photography Takes Over show. I had submitted some photos last year, but was never chosen, so imagine my surprise when not only the original two I submitted were chosen, but one additional one from some requested supplemental photographs was chosen also. While I was smitten with so many chosen for this show, with a hanging fee of $25 a piece and the costs I will be incurring for framing and printing each photograph, this hobby is not a cheap date. 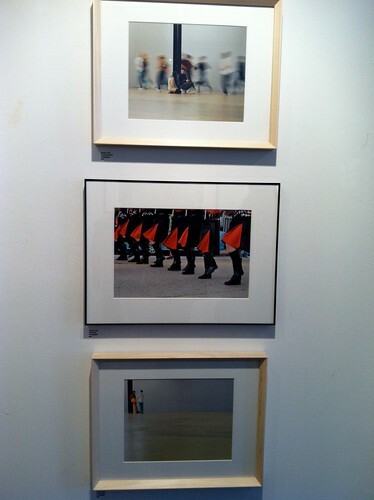 Two of the photographs were taken at the Tate Modern during my trip to London, and the third was taken at the Ossining Fire Department Parade. Cool beans right? Seeing my photos on a wall other than one in my parents house makes me smile. The opening reception for this show was on the day of the Superbowl. I had asked my parents if they wanted to come check it out, and my father’s response….”but, it’s the day of the superbowl”. Apparently he blocked off the entire day for a 6:30pm game. Really? The thing was at 2pm. Needless to say, he went, but had a countdown going the entire way. He also eats a lot of chips and other really bad for you stuff. So I made him some hummus to nosh on instead. Actually, funny story about the hummus. I thought I’d be cool and try to start with dried chickpeas. I soaked them overnight in some water. I used some in some soup I was making and put the rest in the fridge for next time. Then I remembered them and decided to make hummus…the smitten kitchen way. I took them out of the fridge and saw something rather unusual. It seemed that they had sprouted! Whoa….can I still eat them? Apparently you can! So, I threw them in some water and let them soak in some boiling water for a bit until they were easier to crush when squeezed. Once they were cool enough to touch, I peeled them. Yes, it took forever. The reason why it took so long was because not all of them were soft and many of them were not soft enough to be easily peeled. After peeling as many as I could, I threw them into my food processor along with a couple of cloves of garlic and let it rip until the chickpeas are grainy. 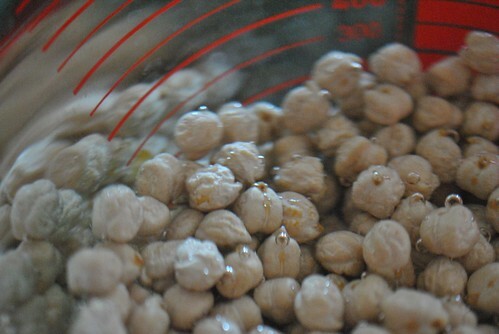 Then I added about a 1/2 cup of Tahini, juice from half a lemon, and let it rip again. But it wasn’t looking like anything closely resemebling hummus at this point, so I added a couple more spoonfuls of Tahini and started to add water until it finally looked like hummus. Mine was definitely not the smoothest hummus ever. It might have something to do with some of my chickpeas not being entirely cooked. Nonetheless, I packed it up and drizzled a little olive oil on top and brought it over with some celery sticks and baby carrots. We actually never got to it. Late brunch with the Westchester Breakfast Club kind of killed our need for snacking. So, I’m going to bring it home and pack myself some hummus and carrots for worktime snacking. Or I will be having a lot of hummus sandwiches for dinner this week! 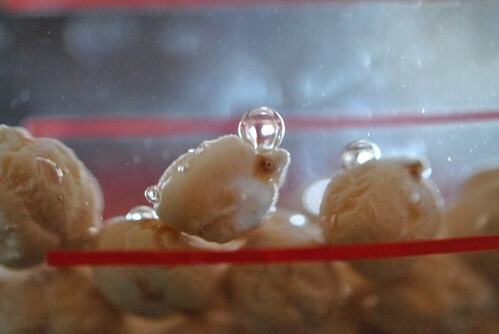 This entry was posted in Photography, snack and tagged Hummus, photography, Sprouted Chickpeas, Upstream Gallery. Bookmark the permalink. Nice job on the hummus and photos!